Who or what is mutilating America's cattle? 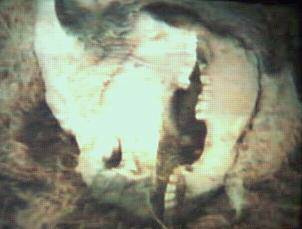 An animal mutilation update by Linda Moulton Howe. Big Mama & the Baby UFOs- Animal Mutilators? Investigation of the Unexplained Death of a Cow in N.E. Utah on October 16, 1998. NAre UFOs responsible for mysterious human mutilations? NIDS has posted three cases of unusual calf mutilations on the What's New section of the web site at: www.nidsci.org. The timeline for Case #1 is given below. NMarch 10, 1997 10:00 AM : Two ranchers on a remote pasture in NE Utah began the daily tagging of calves born the night before. The weather was bright and sunny, temperatures in the 50s. The ranchers estimated they tagged and weighed the 87-pound animal about 100 yards from the fence line. There was a ring of snow surrounding the pasture where they tagged the animal. After tagging the animal, they walked about 300 yards west to another new born animal and went through the process of weighing and tagging that animal. The two were accompanied by their blue heeler dog. About 10:45 AM, the heeler began to growl and act strangely with a focus on the area they had just left. March 10 / 97 10:50 AM: The rancher and his wife, looking back, then noticed a grown cow running frantically back and forth towards the fence line while dragging her leg. Both then walked back to investigate. The rancher reported seeing the recently tagged newborn calf lying eviscerated in the field (see photos), close to where it had been tagged about 45 minutes previously. In a 45-minute period in daylight, 100 yards from any cover, with the rancher about 300 yards away, the calf had most of its body weight removed, including entrails, and appeared to have been placed carefully on the ground with no blood present on or near the animal. Extremely bizarre events taking place in Australia. Somebody--or something--is mutilating kangaroos by cutting off their heads...and leaving no trace of blood or any sign of violence whatsoever. NCattle Mutilations Explained? End Of The Beef Industry? NLink Between Cattle Mutilations And Mad Cow Prions? NMutilated calf at Utah's UFO Ranch. One of the only cases that NIDS has publicly confirmed. Terry Sherman and his wife spent a bright Sunday morning tagging the ears of newborn calves. They put a tag on the ear of a calf born near the ranch house, then wandered out into the pasture for a period of 45 minutes. In that interim period, with the Gormans only 200 yards away in the pasture, the calf was completely stripped of flesh. The Shermans were alerted by a wail from the mother of the calf. The calf's entrails had been placed, almost ritualistically, on the ground, but all of its flesh was simply gone, leaving only bone and hide behind. There was no blood on the ground or on the animal. A NIDS team was at the ranch and quickly scoured the area for evidence. The remains were sent to two pathology labs. Both pathologists concluded the calf had been butchered by two distinct instruments, something like a heavy machete and something like sharp scissors. 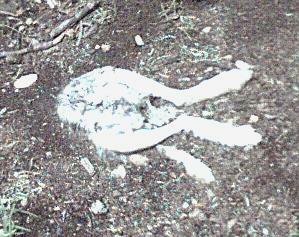 How this was done in broad daylight, in an open pasture and in clear sight of the ranchers remains a mystery. (A second calf disappeared that same morning after being tagged and was never found. In all, 12 cattle have met a similar end since NIDS has been on the ranch. by UUFOH, showed no evidence of a predatory kill, no blood was found, cut was clean & straight, also no insects were noticed, even though it was mid summer. Might this be a 'wild' version of the Cat Mutilations that were common this year?? NIDS has had 12 mutilated or missing cows on the Ranch since they took over in 1996.